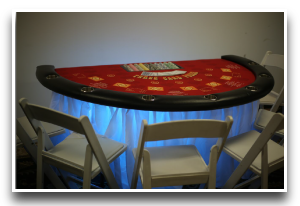 Entertain your guests with a Las Vegas Style Blackjack Table and dealer. 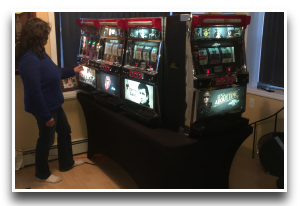 The experienced dealer will teach your guests the rules and make them feel like they are in Vegas. Mood lights and cup holders surround our unique tables. Not only will you love our beautiful new tables but also you will really love our personable experienced dealers. 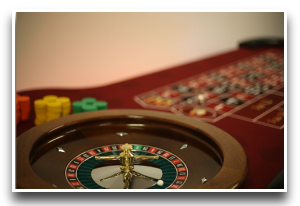 Place your bet on the spinning roulette wheel with an authentic Las Vegas Style Roulette Table and croupier. The experienced croupier will teach your guests the rules and make them feel like they are in Vegas. Our roulette tables are authentic in every way from the mahogany wheel to the dealer. Put your money on the pass line with a Las Vegas Style Craps Table and croupier. The experienced croupier will teach your guests the rules and make them feel like they are in Vegas. 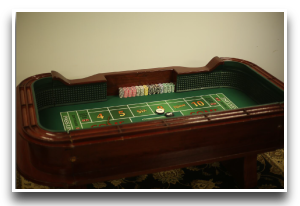 Our craps table is realistic and affordable. The tables have cup and chip holders all around. The amount of fun you will have is off the charts. Texas Hold’em comes to New York! 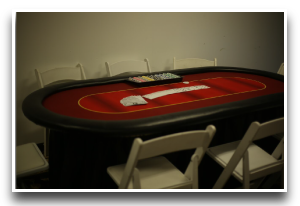 Your guests will flip over this Las Vegas Style Texas Hold’em Table and dealer. The experienced dealer will teach your guests the rules and make them feel like they are in Vegas. Although named Texas Hold’em Tables because of the recent WSOP (World Series of Poker) Phenomenon these tables can be used for any kind of poker and the dealers are experienced in all kinds of unique poker games. Just like our Blackjack Tables they are unique in everyway from the mood lights and cup holders that surround them to the deaind them. Get ready for the lights and bells going off when your guests hit the jackpot with actual Slot Machines from Las Vegas and other casinos from around the world. Our Slots are actually bought from the casinos. Adjusted so they can’t accept real money, they will still give you hours of gambling pleasure. For other event services please visit our sister website Enjoyable Entertainment.